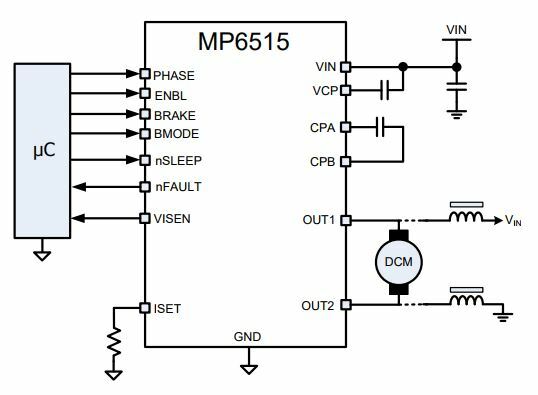 The MP6515 is an H-bridge motor driver. It operates from a supply voltage of up to 35V and delivers motor current up to 2.8A. Typically, the MP6515 is used to drive a DC brush motor. An internal current sensing circuit provides an output with voltage proportional to the load current. In addition, cycle-by-cycle current regulation/limiting is provided. These features do not require the use of a low-ohm shunt resistor. Internal safety features include over-current protection, input over-voltage protection, undervoltage lockout (UVLO), and thermal shutdown. The MP6515 is available in 16-pin 5.0mmx6.4mm TSSOP-EP and 3mmx4mm QFN package with exposed thermal pad.